The DotCom-bubble was triggered by emergence of the World Wide Web and its potent yet easy-to-use web browser Mosaic. Vendors and investors alike declared how the Web would transform business overnight, creating the “New Economy” where everything happened in “real-time,” and commerce moved at the speed of electrons. Amazon.com sprung up and grew quickly selling books online, and every other industry became afraid of being “Amazoned” by a start up. The rush was on to build network capacity and huge server farms, and lots of money was invested. In the end, the Web has become a successful business model, but it has happened more at the rate of the historical technology trend (11% growth per year), not at the rate of the bubble trend. 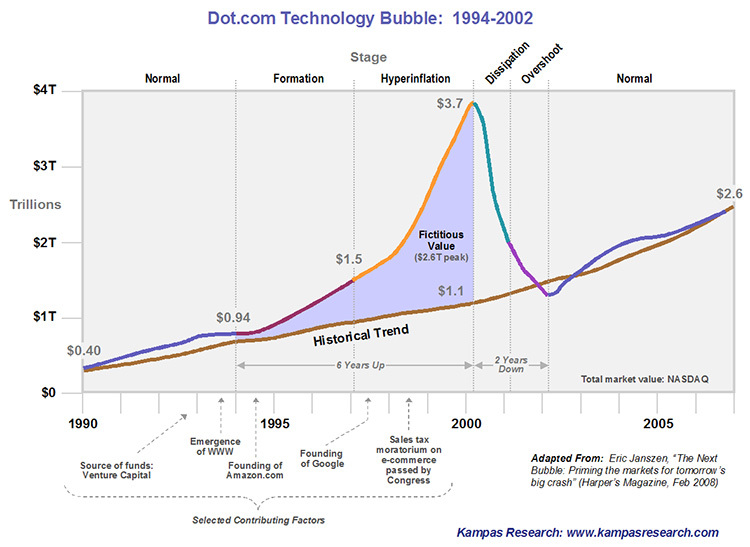 As you can see from the Dot.com bubble diagram below, bubbles are S-curves that collapse very quickly because of the realization/panic that the value being created is “fictitious,” often falling in about a third of the time they took to rise. Boo.com, spent $188 million in just six months in an attempt to create a global online fashion store. Went bankrupt in May 2000. Startups.Com was the “ultimate dot-com startup.” Went out of business in 2002.
e.digital Corporation (EDIG): Long term unprofitable OTCBB traded company founded in 1988 previously named Norris Communications. Changed its name to e.Digital in January 1999 when stock was at $0.06 level. The stock rose rapidly in 1999 and went from closing price of $2.91 on December 31, 1999 to intraday high of $24.50 on January 24, 2000. It quickly retraced and has traded between $0.07 and $0.165 in 2010 . Freeinternet.com – Filed for bankruptcy in October 2000, soon after canceling its IPO. At the time Freeinternet.com was the fifth largest ISP in the United States, with 3.2 million users. The company lost $19 million in 1999 on revenues of less than $1 million. GeoCities, purchased by Yahoo! for $3.57 billion in January 1999. Yahoo! closed GeoCities on October 26, 2009. TheGlobe.Com – Was a social networking service, that went live in April 1995 and made headlines by going public on November 1998 and posting the largest first day gain of any IPO in history up to that date. The CEO became in 1999 a visible symbol of the excesses of dot-com millionaires. Pets.com – a former dot-com enterprise that sold pet supplies to retail customers before entering bankruptcy in 2000. Hotmail – founder Sabeer Bhatia sold the company to Microsoft for $400 million; at that time Hotmail had 9 million members. Open.com – Was a big software security producer, reseller and distributor, declared in bankruptcy in 2001. Infospace.com – In March 2000 this stock reached a price $1,305 per share, but by April 2001 its price had crashed down to $22 a share. lastminute.com, whose IPO in the U.K. coincided with the bursting of the bubble. TheLearningCompany, bought by Mattel in 1999 for $3.5 billion, sold for $27.3 million in 2000. Worldcom, a long-distance telephone and internet-services provider that became notorious for using fraudulent accounting practices to increase their stock price. The company filed for bankruptcy in 2002 and former CEO Bernard Ebbers was convicted of fraud and conspiracy.